Healthy Joints, Healthy Heart, Healthy You with Omega-3 Fish Oil! 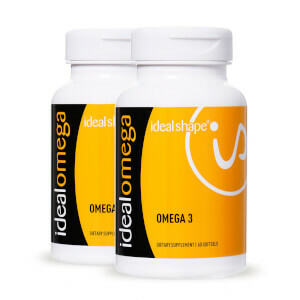 IdealOmega is an omega-3 fatty acid supplement. 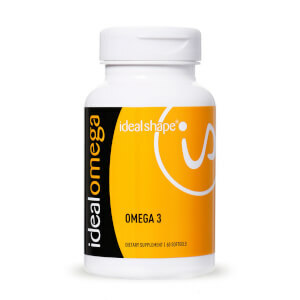 For years scientists have studied the wide variety of benefits that omega-3 has on the human body. From supporting joint health, to heart health, omega-3s have a major impact on your physical health in many ways. It’s clear that your heart and joint health are crucial to your fitness and weight loss goals. Stiff and painful joints make exercise and physical fitness uncomfortable and maybe even painful. And nothing could be more important to proper exercise than a healthy heart. That’s why properly supporting these areas of your health is so critical to helping you achieve and maintain your ideal shape. But since omega-3 fatty acids are essential — meaning your body can’t produce them — you can only obtain this all-important healthy fat from your diet or by supplementation. Unfortunately many of us don’t even get close to the daily recommended serving of omega-3s. That’s where IdealOmega comes in. The World Health Organization recommends 200–500mg of EPA and DHA. 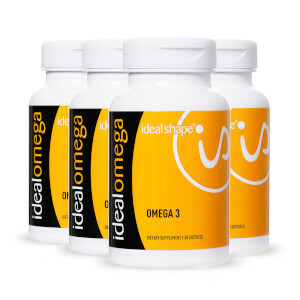 With 360mg EPA and 240mg DHA, IdealOmega will help you easily reach your daily omega-3 needs and support your joint and heart health. Suggested Use: Take up to two (2) softgels daily with any meal of the day. Do not exceed two (2) softgels daily. Not all omega-3 fish oil supplements are created equal. It also depends on the fish used. Larger fish are less sustainable. They also risk becoming contaminated with mercury, lead, and other toxins. This is why the best omega 3 supplements use smaller fish. IdealOmega is sourced from smaller fish in order to avoid these risks. - Optimizes brain development, health, and function. - Plays an important role in the structural fat in the retina of the eye playing which is important for visual development and function. - Helps maintain normal triglyceride levels, heart rate, and blood pressure. - Found in large amounts within heart tissue. - May have an anti-inflammatory effect in the body reducing joint pains and increasing blood flow. - Acts as an anti-inflammatory reducing joint pain. - Shown to reduce triglyceride levels as well as cholesterol. - Lowering cholesterol ultimately leads to better heart health and a reduced risk of cardiovascular disease. Inflammation has also been linked to weight gain and can even prevent weight loss. Many studies have shown that omega-3 fatty acids have the ability to help reduce damaging inflammation within the body. This includes inflammation associated with arthritis. A double-blind trial found EPA to significantly improve skin conditions. A separate clinical study observed reduced inflammation in 67% of acne patients. Research has connected the fatty acids in fish oil to healthy hair and skin. Low levels of omega-3 fatty acids has been found to correlate with higher death rates in patients with coronary heart disease. DHA specifically has been associated with normal triglyceride levels, heart rate, and blood pressure.